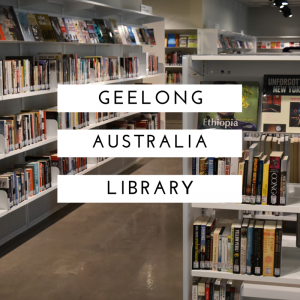 I have many fond memories of trips to the various libraries around Geelong, the city where I grew up, and particularly of the central library which stood on the site of the new building I visited recently, and review below. It was the place where I hunted for Saddle Club or Babysitters Club books to read and cross off on my hand-written list of titles, where I discovered the joys of leaving with as many books as I could carry and my library card would allow. It was also a place my sister and I spent hours lounging in beanbags in the kids reading area while my dad browsed for cds, magazines in different languages, comic books or whatever he happened to be interested in. Of all the physical spaces that loom large in my childhood memories that library sits beside my childhood home, and local parks as a place I’ll never forget. So it might the the oddest looking building I have seen, appearing to be a giant brain rising out of the park, but I am proud of my hometown for investing in the future, and for valuing information, culture and the voices of the past. If you happen to be visiting Geelong, or regional Victoria I highly recommend you check out The Dome! The recently rebuilt Geelong Library is unusual looking but an impressive achievement in making knowledge accessible to everyone. With 6000 square meters of space across 5 public levels the library has a HUGE range of books, as well as a variety of multi-use spaces that were all being enjoyed by visitors of all ages when I dropped in. Some of my favourite features were the chess sets on tables, the semi-enclosed study chairs looking out over the park, the incredible viewing deck and conference space on the top floor, the multi-media center for kids (complete with video games and bean bags), and the ground floor will soon have a cafe (still under construction when I visited). X Factor: Focus on kids! A whole level dedicated to books for children and teens, including a huge selection of picture books, costumes, computers, manga, video game consoles, middle grade and YA novels. It’s a paradise to encourage kids of all ages to develop a love of reading. Click on any of the images below to enlarge, and let me know in the comments your favourite library memory! This is amazing! I have been wanting to take my daughter down to the library since we have moved and keep getting side tracked. I think tomorrow might be our day! My eldest daughter has such a love of books (all my wishes come true) and my 2nd daughter loves carrying them around (although she isn’t reading yet). Loved the link to Neil Gaiman too – I didn’t know they had banned science fiction in China!! I hope you made it to the library Faye! How wonderful to hear that your childhood was filled with library visits just like mine, and that you are encouraging your girls to read as well! The link is a great one, I’m glad you enjoyed it. Neil writes so eloquently! And there is now some great sci-fi coming out of China. I particularly enjoyed The Three Body Problem, which I read last year! To this day, I get more work done at the library than I ever can at home. It’s probably just habit at this point but I prefer smaller libraries that aren’t as crowded and I like going there in the afternoons. I’m far less likely to procrastinate at the library too! Oh I definitely agree with you, there is something about the atmosphere of a library that really helps me get stuck into my work, and to focus for much longer. I guess there are less distractions, but also I feel like I should really be working and not watching silly cat videos! I’ve always under estimated our local library but since our first child was born we’ve really grown to appreciate all the services they provide to our community. My son loves going to ‘rhyme time’ at the library and it’s a great chance for my wife to meet up with other Mothers in the area too. I love taking my little ones to the library, so many great free resources.